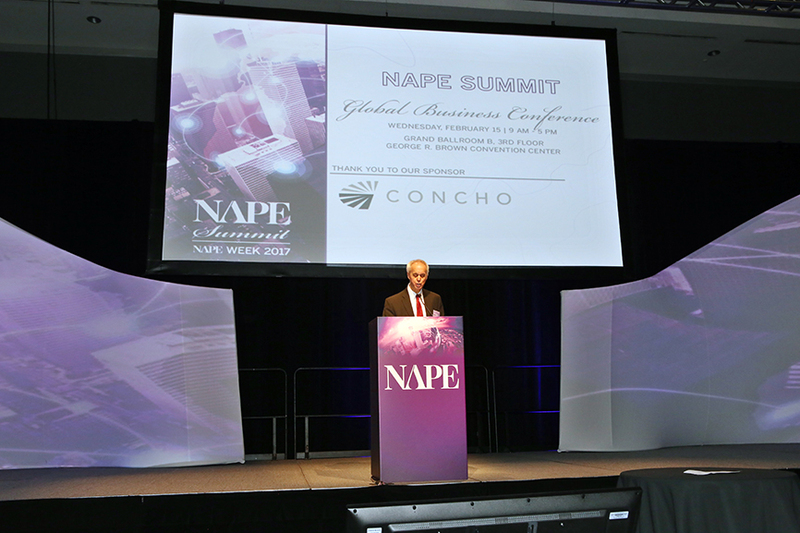 NAPE Summit announced today the speakers and lineup for the 25th anniversary edition of the NAPE Global Business Conference taking place February 7, 2018 as part of NAPE Summit Week in Houston. Keynote speakers include Chesapeake Energy President and CEO Doug Lawler and Quantum Energy Partners Founder and CEO Wil VanLoh. Lawler will keynote the NAPE Global Business Conference with his presentation on “Chesapeake Energy: The Transformation and the Future”. Lawler, who was named president and CEO of Chesapeake Energy in June 2013, brings nearly 30 years experience in the industry. He has served in several senior leadership roles at Anadarko, including senior vice president of international and deepwater operations, vice president of international operations, vice president of operations for the Southern and Appalachia Region, and vice president of corporate planning. VanLoh will explore “The Changing Role of Private Equity in the Energy Industry”. Co-founded by VanLoh in 1998, Quantum Energy Partners manages a family of energy-focused private equity funds, with more than $13 billion in capital under management. VanLoh leads the firm’s investment strategy and capital allocation process as chairman of its executive and investment committees. The conference opens with Joseph Mills, president and CEO for Samson Resources II, LLC, who will present “The Anatomy of a Restructuring: Samson Resources II, LLC”. Mills has a history of success throughout the entire oil and gas industry business lifecycle, from launching startups to managing large publicly traded exploration and production (E&P) and midstream companies. He has extensive industry experience in the mineral, upstream and midstream industries. A morning panel discussion on “The Lifecycle of an Offshore Lease – The Changing Landscape” will be moderated by J. Keith Couvillion, North America land advisor for Chevron U.S.A. Inc. Couvillion has more than 38 years of experience supporting onshore and offshore E&P operations in many capacities throughout the Gulf of Mexico region. Couvillion will be joined by panelists Marty Tate, head of upstream agreements for BHP Billiton Petroleum; Tom Young, vice president of business development for Deep Gulf Energy Companies; and Frank Meyer, land manager for Anadarko Petroleum Corporation. Michael P. Pearson, partner for Jackson Walker L.L.P., will moderate the afternoon panel discussion “Navigating Through the New Oil and Gas World”. With more than 38 years in practice, Pearson has experienced firsthand the boom-and-bust cycle of the energy industry several times since the 1970s as well as its impact on oil and gas producers, pipeline and midstream companies, energy commodity marketing and trading companies, lenders and capital providers. Pearson will lead the discussion among panelists Jerry R. Schuyler, board director and executive consultant for Gastar Exploration, Ltd.; Jason B. Binford, partner at Gardere, Wynne, Sewell, LLP; and Nathan W. Walton, partner at Ares Private Equity Group. Anatol Feygin, executive vice president and chief commercial officer for Cheniere Energy, will explore “US LNG Exports: Two Years Old with a Bright Future”. Prior to joining Cheniere Energy in 2014, Feygin worked at Loews Corporation as a vice president, energy strategist and senior portfolio manager. In these roles, Feygin developed forecasts for Loews' upstream, midstream and services energy platforms to identify risks and allocate capital. The NAPE Global Business Conference will conclude with a discussion on “International Deepwater vs. Onshore – Considerations in the Decision Making Process” between Graeme Gordon, manager of exploration strategy, commercial and planning for Hess Corporation, and Steven P. Otillar, partner at Akin Gump Strauss Hauer & Feld LLP. In addition to managing the exploration strategy, commercial, planning and portfolio team at Hess Corporation, Gordon is a member of Hess Exploration Council and Industry Government Offshore Continental Shelf Advisory Board. Otillar has represented clients in the development, finance, acquisition and divestiture of domestic and international energy projects for more than 19 years, with a particular emphasis on upstream projects in emerging markets. NAPE Summit Week will also feature the annual NAPE Summit Charities Luncheon with Tom Brokaw as keynote speaker; a new Job Fair for upstream professionals; educational seminars presented by industry organizations AIPN, IPAA, SEG and AAPL; domestic and international NAPE Theaters running two days of Prospect Previews and Capital and Service Provider Presentations; and a two-day Expo on nearly 15 acres of exhibition space. The expo will conclude with a Summit sweepstakes drawing for a 2018 Silver Ford F-150 in celebration of NAPE’s 25th anniversary. The Global Business Conference is sponsored by Australia Petroleum and Concho Resources. NAPE was founded in 1993 to help stimulate oil and gas industry activity during a downturn. Since its launch with 800 attendees and 80 booths, NAPE has grown exponentially to include thousands of attendees and hundreds of booths at its two annual expos, NAPE Summit and Summer NAPE. To register for NAPE Summit Week 2018, visit www.napeexpo.com.